Chicago, the "Windy City" as it is often called, lies along the shores of Lake Michigan. It is known for its vibrant arts scene, numerous cultural attractions, excellent shopping, and interesting architecture. 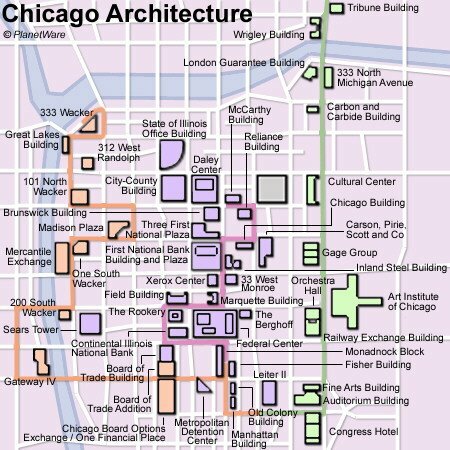 The city enjoys a worldwide reputation as a focal point of 20th-century architecture and art, with architects such as Louis Sullivan and Frank Lloyd Wright, and artists like Picasso, Mirõ, Dubuffet, and Chagall leaving their mark. The city also has much to offer in the sporting sphere, too, with the Chicago Bears in American football, the Chicago White Sox and Cubs in baseball, and the Chicago Bulls in basketball. Last, but not least, are the beautiful beaches. The Art Institute of Chicago is a world class museum with hundreds of thousands of artworks. The diverse collection spans thousands of years and includes pieces from a variety of media including painting, prints, photography, sculpture, decorative arts, textiles, architectural drawings and more. The Institute is known for its collection of impressionist and post-Impressionist paintings including Georges Seurat's 1884 A Sunday Afternoon on La Grande Jatte, Renoir's 1879 Acrobats at the Cirque Fernando, and numerous paintings by Claude Monet. The main building, designed by Shepley, Rutan, and Coolidge in beaux-arts style, was built for the 1893 World's Columbian Exposition. Several other buildings have been added on over the years and today the complex measures 400,000 square feet. Millennium Park is part of the larger Grant Park, located in downtown Chicago bordered by Michigan Avenue to the west, Columbus Drive to the east, Randolph Street to the north, and Monroe Street to the south. Its centerpiece is a 110-ton sculpture name Cloud Gate, which has a polished, mirror-like stainless steel surface that was inspired by liquid mercury. It reflects the surroundings, including buildings, the sky, and the tourists who walk through its central arch. Another top attraction in Millennium Park is Crown Fountain, a fascinating modern interpretation of the ancient gargoyle that gives the appearance of water flowing from the mouths of projected images of Chicago citizens. Other popular things to do here include seeing a performance at the Jay Pritzker Pavilion, an outdoor concert venue, and visiting Lurie Garden, which is open to the public at no cost year-round. Located close to many of the major attractions, as well as great shopping, this area of the city is a convenient place to base yourself. For accommodation suggestions see our list of recommended hotels in this area. The Navy Pier originally opened in 1916 as an amusement area and shipping facility but is now one of Chicago's most popular tourist attractions. 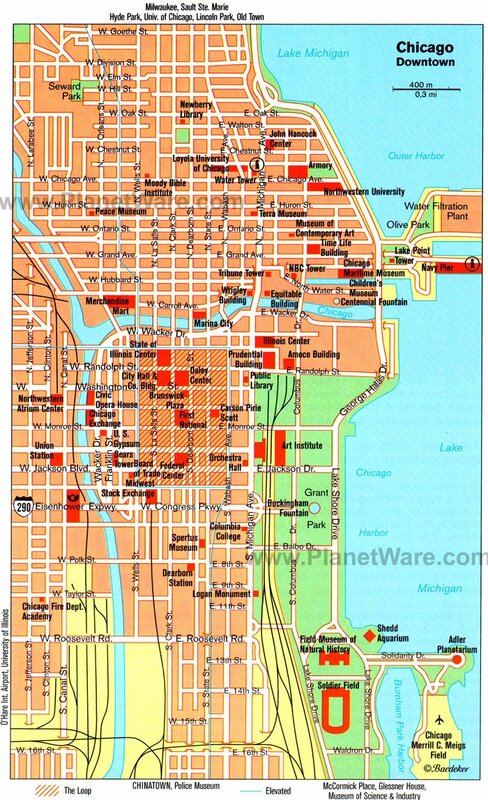 Today, the Navy Pier is made up of 50 acres of gardens, attractions, shops, restaurants, concert venues, and parks. There is a 150 ft Ferris wheel and an historic carousel in Navy Pier Park. Visitors can also watch a film at the 3D Imax Theater, watch actors perform the classics at the Chicago Shakespeare Theater, or visit Crystal Gardens, a one-acre, six-story, indoor botanical garden. Also located here is the Chicago Children's Museum. The Pier hosts year-round festivities, including the Chicago Festival in August. Cruise ships leave from here on various sightseeing excursions. At the north end of Jackson Park is the Museum of Science and Industry, founded in 1933, and arguably the most impressive museum in Chicago. It is devoted to the application of natural laws in technological and industrial development. The museum is thought to be the first in the U.S. to incorporate the idea of "hands-on" exhibits. Visitors are encouraged to interact with hundreds of exhibits. The MSI features permanent and changing exhibits, as well as an OMNIMAX theater. Built in 1927 as a donation from the family, the Clarence Buckingham Memorial Fountain is one of the largest in the world. Designed in the period's iconic Art Deco style, the central fountain is surrounded by four seahorses that represent Lake Michigan's four bordering states. From 8am to 11pm, the fountain bursts to life hourly, shooting 15,000 gallons of water through nearly 200 nozzles each minute to create an impressive display. After dusk, the water show is accompanied by lights, a must-see if you are in the neighborhood in the evening. The fountain is the central focal point of Grant Park, Chicago's expansive public space that contains many attractions and smaller parks like Millennium Park, comparable to Central Park, one of the top attractions in New York City. One of the park's main tourist sites is Museum Campus, home to The Field Museum of Natural History, the Art Institute of Chicago, the Adler Planetarium, and Shedd Aquarium. Grant Park is also home to several gardens and recreational facilities, and hosts events, including music and food festivals. Until 1996, when the Petronas Towers were built in Kuala Lumpur, the 110 story Sears Tower, now Willis Tower, was the world's tallest office block. While there are now several taller buildings, the view from here is incredible. On a clear day you can see 40 to 50 miles over four states, and gain a bird's eye view of Chicago's impressive architecture. The Willis Tower took three years to build and was opened to the public in 1974. The building is 1,453 feet tall with an observation area, called the SkyDeck, on the 103rd floor, 1,353 feet above the ground. A glass box with a glass floor, known as the Ledge, juts out from the SkyDeck, where visitors can stand and look directly down at the city below. 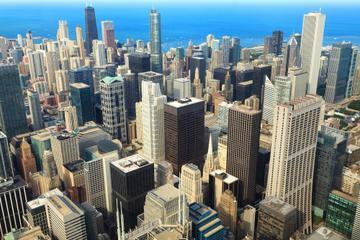 If this is your first visit to Chicago, the SkyDeck is a must-do. Buy your Chicago SkyDeck Tickets in advance to experience the Ledge, explore the exhibits, and watch a short video on the history of the building. Located in the John Hancock Center office building, 360 Chicago is an observation deck on the 94th floor of the John Hancock Building, easy to recognize by its dark metallic looking exterior and cross-braced steel design, which runs up the outside of the building. The large glass-walled observation deck has views that look out over Chicago's skyline and beyond. More adventurous tourists will love the deck's newest feature, "Tilt," which gives visitors a unique view from more than 1,000 feet above the Magnificent Mile as they are tipped outward at an angle to look straight down from the glass enclosure. The rest of the building contains a variety of shops, offices, and apartments, as well as a multimedia exhibit located on the first floor that includes information about the city of Chicago and the construction of the John Hancock Building. Originally called the Columbian Museum of Chicago, the Field Museum of Natural History was founded in 1893 to showcase the biological and anthropological collections gathered for the World Columbian Exposition. The name changed in 1905 to honor Marshall Field, the department store owner, art patron, and major benefactor of the museum. The permanent collection features approximately 20 million artifacts and specimens covering a variety of disciplines including geology, botany, zoology and anthropology. Of special note are the permanent displays on Ancient Egypt and the cultures of North, Central and South America and "Sue," the world's largest, most complete Tyrannosaurus rex skeleton. Special rotating exhibits take place on a regular basis throughout the year. Michigan Avenue is probably one of the most attractive boulevards in America. The city's famous Magnificent Mile is a section of Michigan Avenue north of the Chicago River, with numerous galleries, boutiques, and luxury shops. Some of the attractions along here include the John Hancock Center, the Wrigley Building, and the Tribune Tower. Michigan Avenue splits between North and South designations at Madison Street. This district is also known for its theaters, which host touring plays, musicals, and comedy acts. Wrigley Field, home to the Chicago Cubs, was built in 1914 and is the second-oldest Major League Baseball park in the US, second only to Fenway Park in Boston. The park has seen some legendary moments in baseball history, including the 1917 no-hitter pitching duel between the Cubs' Jim Vaughn and the Reds' Fred Toney, and Babe Ruth's "called shot" during game three of the 1932 World Series. Ballpark tours are conducted in-season, when you can visit the press box and field, as well as the dugouts if there is no game that day. Lincoln Park is a six-mile stretch of green space along the edge of Lake Michigan, and Chicago's biggest park. This popular park is home to the lovely Lincoln Park Conservatory and the Lincoln Park Zoo, one of the oldest zoos in the country. Also located here are the Peggy Notebaert Nature Museum, and the Chicago History Museum. For those who simply want to enjoy the outdoor space there are playing fields, bike trails, jogging paths, and beaches. Visitors can see a number of significant statues and pieces of public art within the park grounds including Augustus Saint Gaudens' Standing Statue of Lincoln (1887). The Chicago River runs through the heart of the city, parallel to the lakeshore, and is known for its astounding number of movable bridges. In just two miles, there are 18 bridges, each with the ability to allow large boats to pass. The McCormick Bridgehouse & Chicago River Museum treats tourists to an up-close look at the mechanisms of one of the city's most famous bridges, where you can actually watch the gears work as it moves. The Riverwalk is home to many dining options and hosts special events throughout the year, and you can also find several river tours and cruises that depart from the Riverwalk. The fully-paved Lakefront Trail offers beautiful views of the city skyline and Lake Michigan, stretching 18 miles from 71st Street on the South Side to Ardmore Street on the North Side. It is open to pedestrians and people-powered wheels, and is lined by parks, gardens, and recreation areas, as well as beaches. 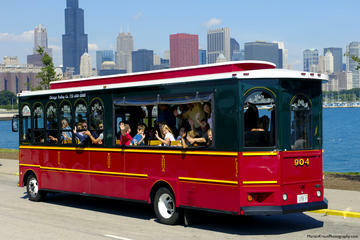 Many of the city's top attractions are located along the trail, including Navy Pier, Lincoln Park, and Soldier Field. The Oriental Institute Museum, located on the University of Chicago campus, is dedicated to the archeology and art of the Near East, including antiquities from excavations in Egypt, Sudan, Nubia, Iraq, Turkey, Israel, and the ancient site of Megiddo. Among the permanent exhibits are the Mesopotamian Gallery, which features objects from between 100,000 BC and the 7th century AD, and two Egyptian Galleries, which include artifacts that range from everyday objects to mummification relics. The Rookery Building was designed by architects Daniel Burnham and John Root in 1888, but the interior lobby and patio were remodeled by Frank Lloyd Wright in 1907. This 12-story building has a Roman Revival and Queen Anne-style façade, but it is the central light court and the ornamental ironwork of the elegant staircases that are the true gem of the building. The Rookery, named for the large number of pigeons that frequented the building, is listed on the Register of National Historic Places. The Frank Lloyd Wright Trust conducts tours of the building, as well as other sites, like the Robie House in Hyde Park and the Bach House. The best sightseeing, shopping, and dining and the most interesting architecture are found in Chicago's city center, and this is where most visitors will want to stay. The city center encompasses the famous Magnificent Mile and areas of the waterfront, which are particularly popular in summer. Below are some highly-rated hotels in convenient locations. Luxury Hotels: At the high end of the luxury hotels is the Langham, with a beautiful riverfront location, and close to the Magnificent Mile, Millennium Park, and Navy Pier. The recently renovated Hyatt Chicago Magnificent Mile is a more modestly priced top-end hotel with a great location in the city center. In this same category and close to everything is the Radisson Blu Aqua Hotel. This hotel offers beautiful views over Lake Michigan and Millennium Park. Mid-Range Hotels: In a good location, within walking distance of many of the major sites and set in the heart of the theater district, is the Hampton Majestic Chicago Theatre District. The Kinzie Hotel is a popular contemporary boutique hotel, centrally located for sightseeing and shopping. In a great location, just a couple of blocks off the Magnificent Mile, is the ACME Hotel Company, which describes itself as "hip" but is also quirky and cozy at the same time. Budget Hotels: Budget options in the city center are few and far between. The Hampton Inn Chicago Downtown has a decent location in the city center, with small rooms for Hampton but good service. The best bargains are outside the city center and require some commuting. Two good-value options are the Majestic Hotel and Best Western Plus Hawthorne Terrace Hotel, both in the Lakeview East neighborhood, north of downtown. Chicago's Landmarks: The four-hour Chicago Grand Half-Day Tour is the perfect way to be able to see and learn about the city's most important landmark buildings and sights. The narrated coach tour takes a scenic route along the lake through Grant Park and past some of its most iconic attractions; drives down Chicago's Magnificent Mile; and tours the South Side, where you can see President Obama's former home. See the sights: For general sightseeing, the Hop-On Hop-Off Bus or Trolley Tour is the easiest and most convenient way to see the highlights of the city and to get oriented. For first timers, this is a must. Get on and off at the sights that interest you, skip those that don't, and learn a little history from this narrated tour. If you are spending more than one day in the city, do this tour on day one to get the layout of the city and figure out where you might want to spend the rest of your time. If you are visiting during the warmer months, consider taking a Segway Tour. These are small groups of just eight people and one guide. You will be given a short training session and then head off on a guided tour. Special Interest Tours: The Chicago Mob and Crime Tour is one of those unique tours that can only exist in certain cities, like Chicago. This tour takes you to sites associated with some of the city's most notorious gangsters of the 20th century, including Al Capone and John Dillinger. Anyone who reads crime novels will love this tour. During the summer months, check out the Chicago Architecture River Cruise. You don't have to be an expert to appreciate the city's fine buildings, and this 75-minute cruise is a great way to see and learn about Chicago's architecture.